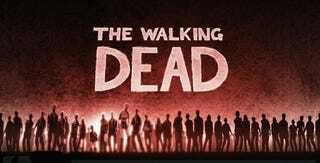 How do you make the title sequence for the incredibly dark and bloody TV adaptation of the Walking Dead comic? One brilliant artist gave it a go, and the results are gruesomely fantastic. Check it out. I wondered what the opening titles to this terrifying new television show might look like... so I animated a spec title sequence, using artwork ripped from the pages of the comic, originally illustrated by Charlie Adlard and Tony Moore. We're not sure if Frank Darabont will even include a title series, or if he'll opt for the minimalist Lost approach when announcing Walking Dead. What we do know is that we want this series to start tomorrow. Sadly we'll all have to wait until October 31st, on AMC.